Find out who gets non-Hodgkin lymphoma, where it starts and how common it is. Lymphoma means cancer of the lymphatic system. The lymphatic system is a system of thin tubes and lymph nodes that run throughout the body. Lymph nodes are bean shaped glands. The thin tubes are called lymph vessels or lymphatic vessels. Tissue fluid called lymph circulates around the body in these vessels and flows through the lymph nodes. The lymphatic system is an important part of our immune system. It plays a role in fighting bacteria and other infections. And it tries to destroy old or abnormal cells, such as cancer cells. There are 2 main types of lymphoma. They are called Hodgkin lymphoma (HL) and non-Hodgkin lymphoma (NHL). Hodgkin lymphoma was named after the doctor who first recognised it. It used to be called Hodgkin's disease. Hodgkin lymphoma has a particular appearance under the microscope and contains cells called Reed-Sternberg cells. NHL looks different under the microscope and does not contain Reed-Sternberg cells. It is important that doctors can tell the difference between Hodgkin lymphoma and NHL. They are two different diseases. Although they are very similar in many ways, the treatment for them is not quite the same. There are more than 60 different types of NHL. They can behave in very different ways. Your doctor or specialist nurse will tell you about the type you have. If you have lymphoma, some of your white blood cells (lymphocytes) divide abnormally. Normal white blood cells have resting time. But if you have lymphoma some of your white blood cells don't have any resting time. This means they divide continuously, so too many are produced. And they don't naturally die off as white blood cells normally do. These cells start to divide before they are fully mature. So they can't fight infection as normal white blood cells do. The abnormal white blood cells start to collect in the lymph nodes, or in other places such as the bone marrow or spleen. They can then grow into tumours and begin to cause problems in the lymphatic system, or in the organ in which they are growing. For example, if a lymphoma starts in the thyroid gland it can affect the normal production of thyroid hormones. Because the lymphatic system runs through your whole body, you can get NHL just about anywhere. It is most commonly noticed first in the lymph nodes in the neck. It is quite common to find it in the liver or spleen. 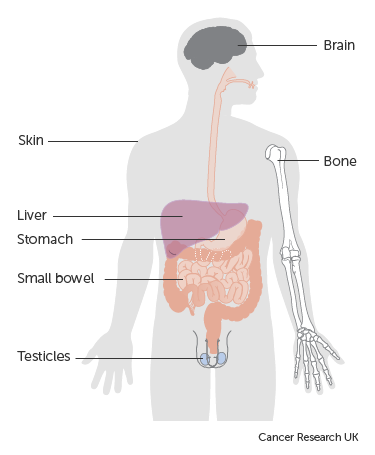 But it can also be found in other body organs, such as the stomach, small bowel, bones, brain, testicles or skin. Although very uncommon, it can also affect the eye. About 1 in 4 people (25%) who have NHL have some lymphoma in an organ outside the lymphatic or bone marrow system. It is then called extranodal (or extralymphatic) disease. Most types of cancer can spread to the lymph nodes. But they are not lymphoma. Lymphoma is cancer that starts in the lymph nodes. For example, if breast cancer spreads to the lymph nodes in the armpits it does not become lymphoma. The cancer cells that have spread to the lymph nodes are still breast cancer cells. So they are treated as breast cancer. If your cancer has spread to the lymph glands (and is not lymphoma), you should look for information about that type of cancer. There are many different types of NHL. These types can be classified in several different ways. One way is by the type of cell affected. NHL affects certain white blood cells called lymphocytes. Two types of lymphocyte can be affected – B cells and T cells. So you can have a B cell lymphoma or a T cell lymphoma. Most people with NHL have B cell lymphomas. T cell lymphomas are more common in teenagers and young adults. NHL is not treated in quite the same way in children as it is in adults. So while some of the information here is useful, you do need to be careful. Check with your doctor which parts apply to you or your child. Around 13,700 cases of NHL are diagnosed each year in the UK. This makes it the 6th most common type of cancer in adults (not counting non melanoma skin cancer). Out of every 100 cancers diagnosed, around 4 (4%) are non-Hodgkin lymphomas. It is more common in older people. 35 out of 100 (35%) of people diagnosed with NHL are aged 75 and over. NHL is slightly more common in men than in women.